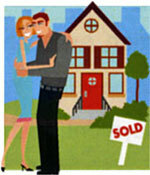 Buying a new home is one of life's most gratifying experiences. As you approach the big day of closing, however, all the details can be a little overwhelming. You might easily overlook the single most important step in the entire process—the purchase of title insurance on that wonderful new home. You have just settled into your wonderful new home. It was difficult making the down payment, and you had to dip into your savings to remodel the kitchen. Two months later, your new kitchen is complete and all the boxes are finally unpacked. Suddenly you learn that a child born after the date of the seller's will is claiming his interest in your property. After an exhausting, expensive legal battle, the claim is found to be valid. You lose your home, your down payment and all the money you invested in the remodeling. Unfortunately, nightmares like this can and do happen. But there is a way to protect yourself from such calamities. Owner's title insurance not only protects you, but your heirs for as long as they own the property, from financial loss caused by title problems. Your title insurer even agrees to bear the full cost of defending you against such claims. A one-time premium provides all this coverage on the single largest investment you may ever make. Nothing else guarantees a home buyer's peace of mind quite like title insurance. Even after the most meticulous search of public records, any number of problems can remain undisclosed that can make a title defective. These hidden "defects" are dangerous because you may not learn about them for many months, or even years. Yet they could force you to spend substantial sums on a legal defense, and still result in the loss of your property. Your lender will likely require that you purchase a Lender's Policy. This policy insures only that the financial institution has a valid, enforceable lien on the property. It does not protect you. An Owner's Policy, on the other hand, is designed to protect you from title defects that existed prior to the issue date of your policy. It also covers the full cost of any legal defense of your title. The one-time premium for an Owner's Policy is directly related to the value of your home. Paid when you purchase your home, it continues to provide complete coverage for as long as you or your heirs own the property.